Most organizations have created a website, and may even have a mobile site. Many also have a presence on their social media sites, with great videos that showcase their people, their products and their brand. So what’s next? Get ready to add Augmented Reality to the mix! Augmented Reality is an exciting technology that changes our interactions with the world by overlaying links, images, and information onto whatever you’re viewing on your mobile device. You simply point your smartphone at an object and see information displayed over the image. The effortlessness and the impact of this innovative process will make your company stand out in the crowded marketplace. Brandemix can help you develop an Augmented Reality strategy that allows customers and potential employees to point their mobile devices at your building and see information displayed over the image. With the right app, potential candidate could point their phone at a building or office and immediately see what positions are available in an organization. Links could appear that lead to videos of employee testimonials, for example, and they would be able to have an application form sent to them by email, or even to schedule an interview. 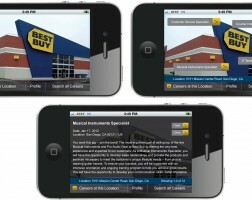 Or we can add augmented reality to an ad that will allow customers to interact with your products and news. For people serious about corporate branding and digital strategies that incorporate their value proposition or employer brand into their advertising, marketing and communications, Brandemix is the agency to add augmented reality into the mix! Contact Brandemix today to augment your reality.